[prMac.com] Bellevue, Washington - Eltima Software today is pleased to announce the official release of their new app for Mac - Elsewhere: ambient nature sounds. Elsewhere is a sound app that emits random environmental sounds of a high quality. The created atmosphere helps to either relax and rest or concentrate on work. The comprehensive interface of Elsewhere allows easily choosing the atmospheres, adjust the volume, and switch between day and night sound modes. The sounds are absolutely random imitating the rhythm of real nature sounds. 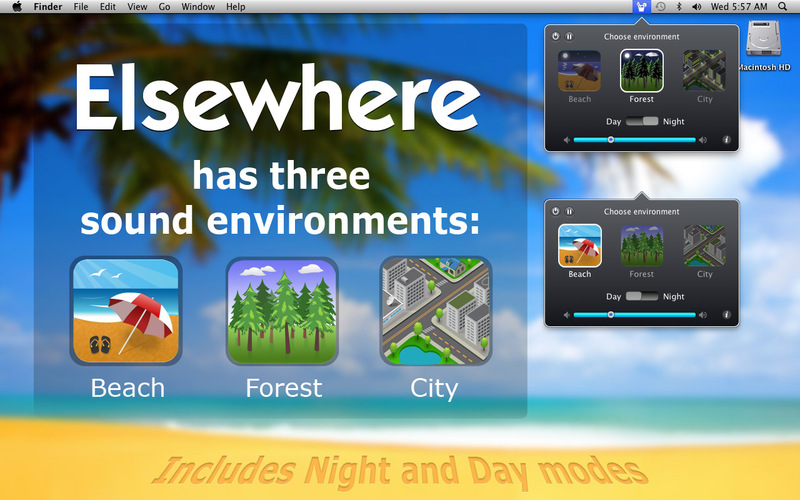 Elsewhere 1.0 offers three environments: Beach, Forest, and City. More ambients will be added in future releases. Elsewhere automatically switches between day and night depending on your time zone, but it is possible to switch between day and night manually when needed. The intro of each environment is available for listening on the developer's website. Elsewhere: Ambient Nature Sounds 1.0 is only $0.99 USD (or equivalent amount in other currencies) and available worldwide through the Mac App Store in the Music category. Eltima Software is a global software Development Company, specializing primarily in serial communication, mobile and flash software for Mac OS and Windows. Eltima Software delivers top-notch solutions having a friendly team of 40 professionals. Copyright (C) 2011 Eltima Software. All Rights Reserved. Apple, the Apple logo and Macintosh are registered trademarks of Apple Inc. in the U.S. and/or other countries.